Folk singer and storyteller John McCutcheon started writing songs for children, as well, in the 1980’s. His 1993 album Family Garden included a song about adoption; and that song was released in illustrated book form in 1997. 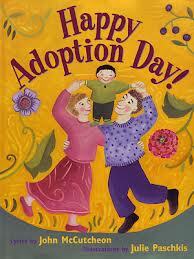 The resulting book, Happy Adoption Day, is a colorfully illustrated book. The song lyrics provide the text of the book and celebrate the anniversary of a child’s adoption. Music is included to allow families to sing along. The book tries to send a positive message: we, your parents, are happy that we adopted you and we celebrate your inclusion in the family. It lends itself to commemorating the anniversary of a child’s adoption. I can imagine it being most helpful to families where the child was adopted when old enough to remember the adoption. I’d recommend it specifically to families with kids up to age 9 who were adopted from foster care after age 3 or 4. I have two concerns to raise; the first isn’t as serious as the second. 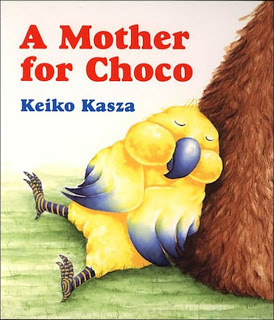 First, the book universally portrays the adoptive family as happy. It’s important for adoptive parents to embrace all aspects of a child’s emotions – but I’m not so concerned about that, because it’s a bit unrealistic to expect any one children’s book to have a full, well-rounded exploration of adoption. Try doing that in 100 words! It’s not that easy! My second concern is more serious. The chorus of the song refers to the child’s previous life as “a world so tattered and torn.” Because it is the chorus, the child would sing or hear it three times, each time the song is sung. When juxtaposed with the universally happy portrayal of the child’s adoptive family, this could encourage the child to view the adoptive parents as “saviors” and may create a sense of shame as the child reflects on the circumstances of life prior to adoption. Celebrating a child’s inclusion in your family is important – especially for children who have bounced around from foster home to foster home. If they’ve felt unwanted – or been told that they’re not wanted (by foster parents or whoever) – this song serves to refute that message. But I’d suggest that clever parent-readers of the book find a way to change the “out of a world so tattered and torn you came to us on that wonderful morn” line to something less negative. Maybe, “sometimes we’re fresh, and sometimes we’re worn, but you came to us on that wonderful morn…” Any poetically inclined readers have ideas to share?